I got this dress at h&m for 10 bucks! A houndstooth 60s style shift for 10 bucks? Not even a question! I knew it would be a little bit short for my taste, but I also knew that a quick fabric fix could add a few inches. This quick fix can be applied to most shorter dresses and even skirts, tunics and pants. In the case of this dress, because the lines are so simple and the fabric is pretty sturdy, I was able to add a simple band of similar weight fabric. If you’re working with a lightweight fabric, this method can still be used, but it may need a little adjustment based on the fabric you’re using. **Choose a fabric** I recommend taking your dress with you to the fabric store. Find a fabric with a similar weight and drape as the fabric used on your dress (or skirt or tunic..whatever you want to lengthen). 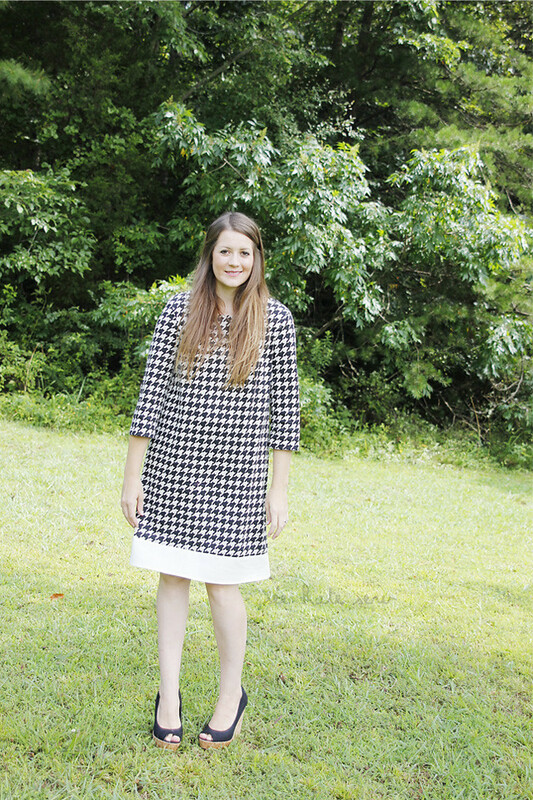 You’ll need about a quarter yard for a simple shift dress. Start by laying your dress down flat and place two layers of fabric underneath. Make sure the fabric has right sides together, so you’ll draw on the wrong side of the fabric. Use a ruler to continue the line of the side seam onto your fabric, adding 1/2″ for a seam allowance. Repeat on both sides. Decide how many inches you want to add to the dress and then add 1″ to that for the hem. Trim the bottom to your length. Now, sew the two side seams together on your extender fabric and hem the bottom by folding over 1/2″ twice and sewing in place. Next, pin the band of fabric to the bottom of the dress, right sides together. Sew it up and press the seam allowance up. I left the original dress hem intact. I liked the double stitching on top and wanted to keep that feature. Depending on the dress, you can always undo the dress hem first and then add the fabric, it’s up to you! It works for shirts, too. I’ve extended the life of Bit’s shirts by adding a band of similar fabric to the bottom. She always grows out of something length wise long before she gets wide enough for the next size up! I like the dress as a whole better with the band. Great idea Kate. This is a great tutorial. H&M dresses can be so cute, but so short. I have had the same problem. I added lace to one of my dresses to try and fix that problem. kate, you look sooooo adorable in this dress!!!! Great idea for those dresses that are too short! Love it! Genius! You are so pretty! I like how your dress turned out. The hemlines are so short this year! I used a slightly different method to lengthen my skirt so I wouldn’t have to hem.